TORONTO – A new office tower is set to transform Toronto’s downtown east side. 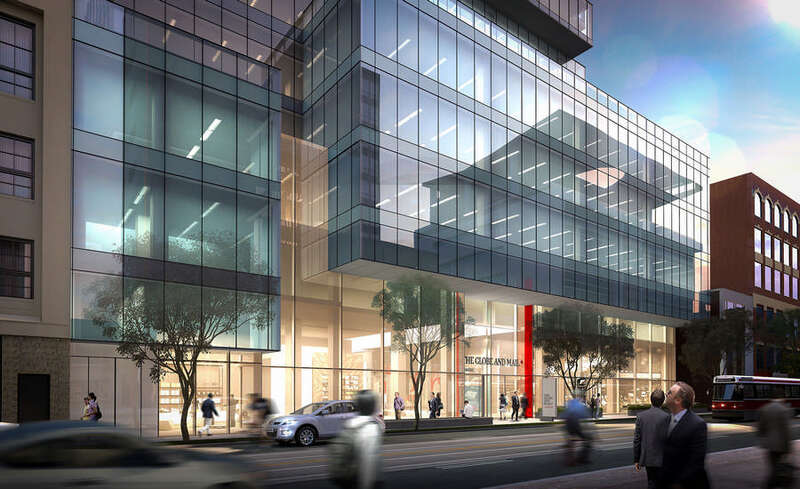 The 500,000-square-foot Globe and Mail Centre will be the new home of Canada’s national newspaper and will anchor the emerging St. Lawrence neighbourhood as a hub of urban activity and corporate offices. The 17-storey building designed by Diamond Schmitt Architects presents a sequential stacking of alternate-sized floor plates interlaid with terraces that give the structure a distinctive and contemporary profile. A high-performance building envelope and advanced glazing system supplies the energy-efficient LEED Gold candidate tower with daylighting deep into the core. Ten-foot-high windows offer views to the waterfront and city skyline. “We think the building design is a game-changer for the downtown,” said Donald Schmitt, Principal with Diamond Schmitt Architects. For developer First Gulf, The Globe and Mail Centre represents a bold addition to its commercial real estate portfolio with a flagship anchor tenant. “Our vision to create a centre featuring innovative architectural design with great outdoor amenity spaces is another example of the commitment First Gulf has made to the continued growth of the area,” said First Gulf CEO David Gerofsky. The tower occupies a block defined by King Street East, Front Street East, Berkeley and Princess Streets, with a public midblock connection between King and Front with retail amenities at grade. The site is on the original ten-block grid of the former Town of York, where Toronto began. Artifacts and foundations discovered on an archeological dig from the 18th-century Berkeley House will be on display in the public areas to enhance this connection with the past. “For The Globe and Mail, which began publishing in 1844 as The Globe, and whose offices once were on King St., this move is a return to its roots, but into a building designed for 21st-century business needs,” added Schmitt. The media company will occupy Levels 13 through 17 connected by a convenience stair. The building’s core design allows for flexible workspace configurations to meet current and future needs of a dynamic 24/7 work environment. Level 17 has 15-foot ceilings and floor-to-ceiling vision glass and a 300-seat multipurpose room with adjacent direct roof terrace access. The building is set to break ground in October with occupancy scheduled for 2016. Diamond Schmitt Architects (www.dsai.ca) is a full-service architecture firm and designs commercial, institutional, residential, health care and cultural buildings. Recently opened projects include The Hospital for Sick Children Peter Gilgan Centre for Research and Learning and the New Mariinsky Theatre opera house in St. Petersburg, Russia.